URBAN INTERSECTIONS was an interactive public installation incorporating Second Life users in a first life public space. Located on the regenerated landscape of the Waterfront Plaza directly outside the newly developed concert hall building, this utilitarian environment was used as a stage set to represent an augmented garden where we explored the concept of perimeters and territories, as a metaphor of Belfast’s social history. As the participants walked through this urban landscape, both first and Second Life inhabitants came ‘face-to-face’ on screen, revealing a live digital mural on the façade of the Waterfront building. A large format projection screen on the building displayed the Waterfront counterpart in Second Life; a virtual plaza encapsulated by the ironies, contradictions and obscurities of a divided city. This projected digital mural formed the central focus of the installation and immediately spoke of the infamous painted murals on houses across West Belfast that depict a deep political divide, but whose post-conflict society now refer to as a stark reminder of recent troubles and thereby holding the peace that now prevails. In a city such as Belfast it would be impossible to evade such references when projecting images onto a building, as though the project itself were projected onto the gable end wall of a house on the Falls Road or the Shankill Estate. Reliant on both user interaction and input the audience formed an integral part of this installation that aimed to transcend these boundaries through interactive storytelling and memory building in a post-conflict society. This allowed ‘first life’ visitors and ‘second life’ avatars to coexist and share the same plaza in a live interactive public online installation. The complete installation utilised three interface techniques developed by the artists taking part. Charlotte Gould’s motion tracking interface allowed visitors in Belfast to wear a large puppet like copy of her unique avatar head, covered in an array of LED lights that were tracked, they could then control the movements of the Second Life avatar as a means of alternative navigation through a maze of garden chain-link fences. Paul Sermon’s interface combined first life visitors and Second life avatars within the same live video stream. By constructing a blue chroma-key studio in Second Life it was possible to mix live video images of online avatars with the audience in Belfast, enabling these participants to play and converse on a collaborative video stream simultaneously displayed in both first and second life situations, allowing the participants to interact and direct the narrative by their presence and movements immediately in front of the projection screen on the Waterfront building The third installation was developed by sound and media artist Peter Appleton, who’s contribution included a barbecue on the Waterfront plaza that simultaneously controlled the conditions of an identical Second Life barbecue. 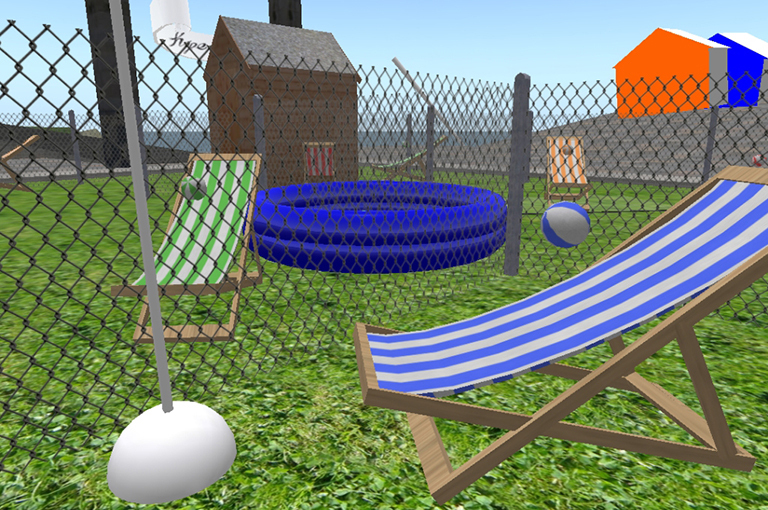 Through a series of light and heat sensors it was possible to relay commands to the online situation, so when the first life barbecue was lit so too was the Second Life barbecue and as food started to cook and brown so did its online duplicate. All these interfaces referred to the domestic garden and their infamous Belfast perimeter fences. The aim was to break down these boundaries through social interaction that prevailed, be it through a video portal, a didactic maze or over a grilled sausage.